This blogpost is the final one of four looking at the Transforming Care programme through the prism of the national statistics regularly produced by the ever excellent @NHSDigital, updating a series ofblogposts I wrote towards the end of 2017. The first blogpost looked at statistics on the number of people being admitted to inpatient services, and where they were being admitted from. 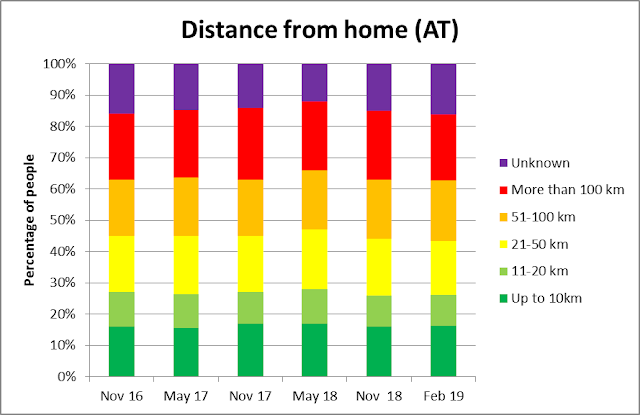 The second blogpost looked at when people were in inpatient units, how far were they from home and how long were they staying in inpatient services. The third blogpost looked at planning and reviews for people within inpatient services. This final blogpost will focus on the number of people leaving inpatient services (charmingly called ‘discharge’) and what is happening leading up to people leaving. Getting people out of inpatient units has arguably been the major focus of activities under the Transforming Care banner. Again, at this point the impact of the Transforming Care programme should be visible in the number of people getting ready to leave, how well people’s plans to do so are developing, and how many people are actually leaving to places outside inpatient services. The first and most obvious question is whether people in inpatient services have a planned date to leave (I will pick up on the complications of what ‘leaving’ actually means later in this post). 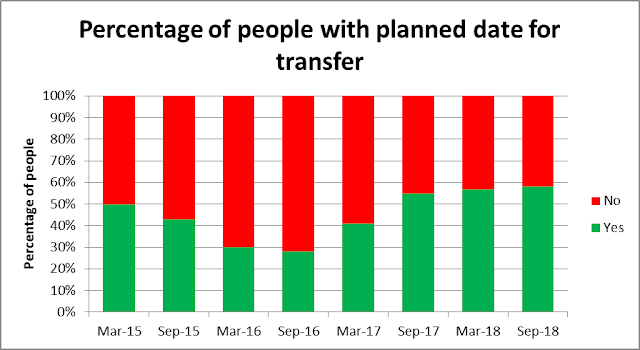 The graph below shows the proportion of people in inpatient services with a planned date for transfer, from March 2015 to September 2018 (according to Assuring Transformation data). 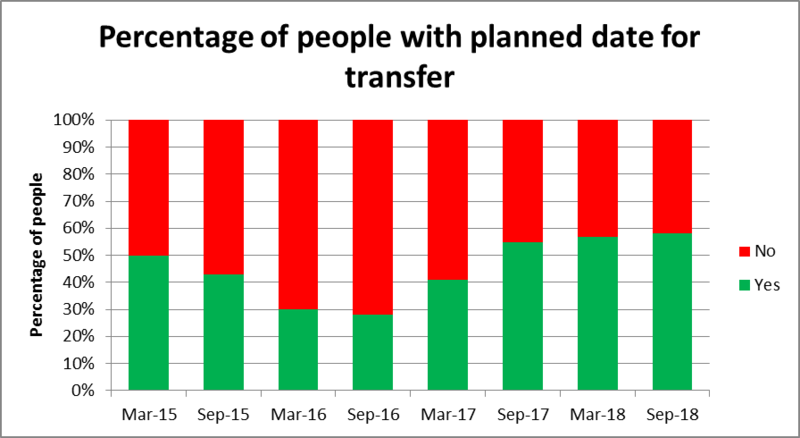 There was a worrying drop in the proportion of people with a transfer date in 2016, but by September 2018 well over half of people (58%) had a planned transfer date, the highest proportion recorded to date. A date might be ‘planned’, but how distant in time is the planned transfer? 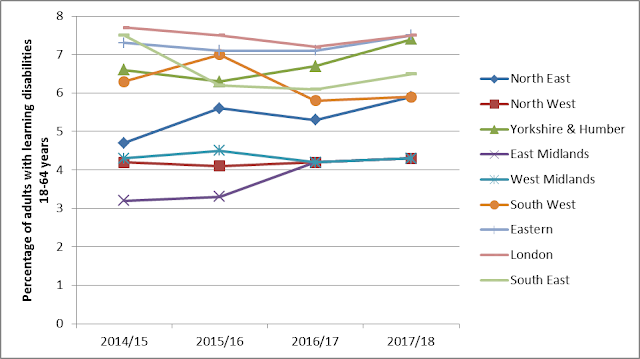 The graph below shows this information according to Assuring Transformation data, from March 2015 through to September 2018. Consistent with the earlier graph, the proportion of people without any planned date to leave at all increased hugely in 2016, with the position recovering throughout 2017 and 2018. 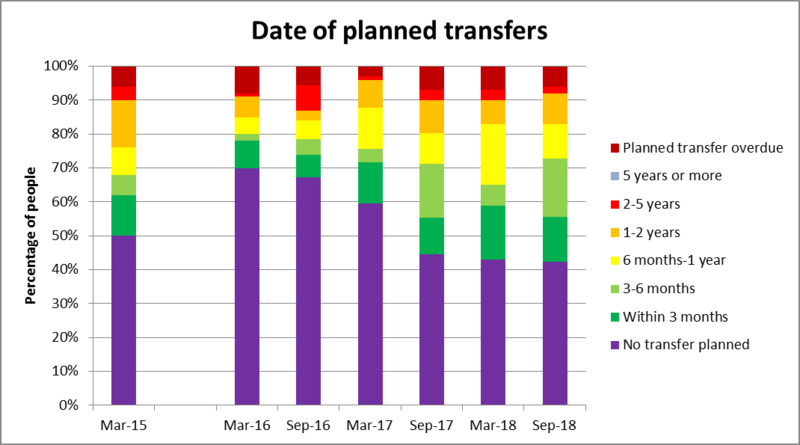 By September 2018, 13% of people had a planned transfer date within the next 3 months, 17% had a planned transfer date between 3 and 6 months ahead, and 10% of people had a planned transfer date between 6 months and a year ahead. For 9% of people their planned date to leave was between 1 and 5 years ahead, and for 6% of people their planned date to leave was overdue. So far, the statistics look like there is a push from Transforming Care that is having an impact on the number of people with plans to leave, although this push does not seem to have massively accelerated as the finish line for the policy comes closer. Do we know anything about the plans themselves? Well, if people are leaving the inpatient unit to go home in some sense then my expectation would be that the person’s local council should be aware of the plan to leave. The graph below shows information from Assuring Transformation based just on those people with a plan to leave – for this group of people, are councils aware of the plan? Over time, the proportion of people with a plan where their council is aware of that plan continues to drop substantially – from over two thirds (69%) in March 2015 and March 2016 to less than half (49%) in September 2018. 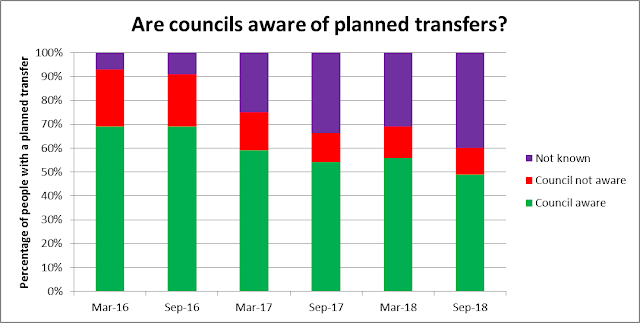 Just as worrying is that in September 2018, for two fifths of people (40%) it wasn’t known whether the council was aware of the plan or not, a huge increase from March 2015 (7%). At the very least this suggests that the close working between health and social care envisaged as central to Transforming Care is less than universal. There are other signs too of potential haste in making plans to leave. The Assuring Transformation statistics report whether a range of people (the person themselves, a family member/carer, an advocate, the provider clinical team, the local community support team, and the commissioners) have agreed the plan to leave. For those people with a plan to leave, the graph below reports the proportion of their plans that have been agreed by different people, from March 2016 to September 2018. Over time, the proportion of plans agreed by anyone and everyone potentially involved has plummeted. 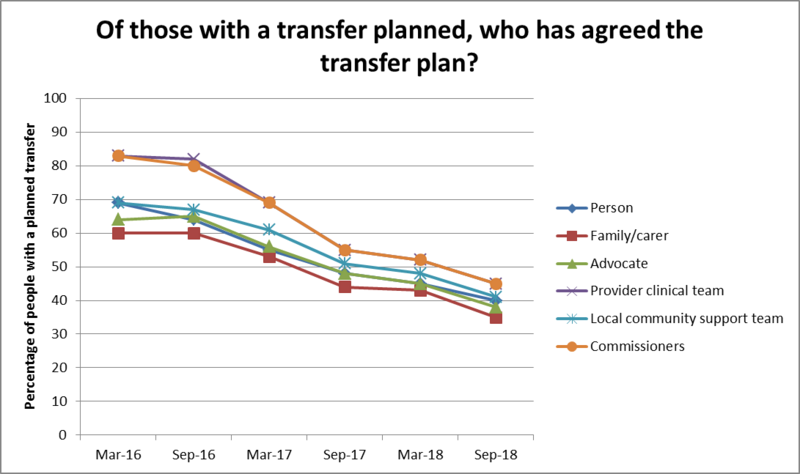 Only two-fifths of plans (40%) had been agreed by the person themselves in September 2018, compared to almost two thirds of people (64%) in March 2016. Even bigger drops are reported for the proportion of family/carers (from 60% to 35%) and advocates (from 64% to 38%) agreeing the plans. 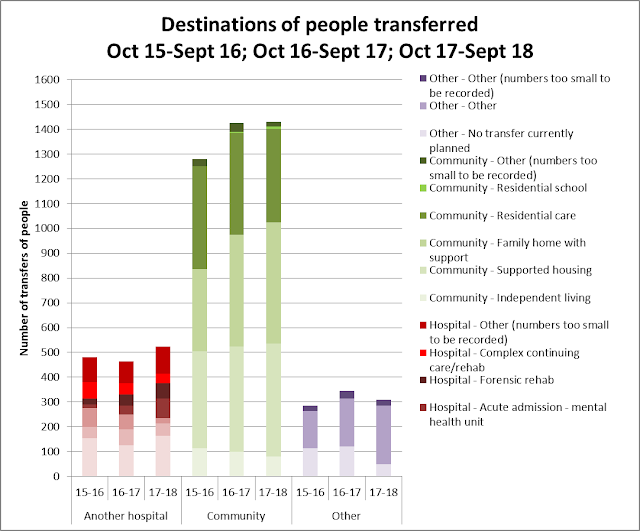 By September 2018, transfer plans had been agreed by a minority of provider clinical teams where the person was supposed to be moving to (from 83% in March 2016 to 45% in September 2018), a minority of local community support teams in the area the person was supposed to be moving to (from 69% to 41%) and a minority of those commissioners who are reporting the information the graph is based on! (from 83% to 45%). To what extent are these actually feasible and sustainable plans that will result in a better life at home for people in inpatient services, and what are their chances of breaking down? The final graph in this blogpost series is one of the most important – how many people have actually been transferred from inpatient services, and where have they gone? The graph below adds up monthly ‘discharges’ from inpatient services in the Assuring Transformation dataset for three periods of time; a year from October 2015 to September 2016, a year from October 2016 to September 2017, and a year from October 2017 to September 2018. It’s also one of the most complicated graphs in this series, so I’ll go through it in a bit of detail. The first thing to say is that overall the number of people ‘discharged’ from inpatient services has increased, from 2,045 people in 2015/16 to 2,265 people in 2017/18. Of the people who have been ‘discharged’, in 2017/18 almost a quarter of people (535 people; 24%) moved to independent living or supported housing. Another fifth of people (490 people; 22%) moved to their family home with support, making nearly half of everyone ‘discharged’ from inpatient services. Where did everyone else go? For almost a quarter of people in 2017/18 (525 people; 23%) their ‘discharge’ was actually a transfer to another inpatient unit, confirming the picture of ‘churn’ of people passed around inpatient services found elsewhere in this series. Hundreds of other people (375 people; 17%) moved into residential care. Given that some inpatient services have re-registered themselves as residential care homes with the CQC and a panoply of 'step-down' and other services are registered as care homes, it is unclear to what extent people are leaving an inpatient service to move somewhere more local and homely, moving somewhere very similar to where they were, or not actually moving at all. In 2017/18, there were also another 235 people (10%) who moved to an ‘other’ location – again it is unclear what these ‘other’ places are, but are they wildly different from where people were moving from? Finally, 50 people (2%) were in the puzzling category of ‘no transfer currently planned’ while having apparently already been transferred. There are also signs of some changes over time in where people are being ‘discharged’ to. Increasing numbers of people are being ‘discharged’ direct to another inpatient unit, or to ‘other’ places that may well be varieties of relatively restrictive places described as ‘step-down’, ‘rehab’ or similar. Fewer people are moving to independent living homes or to residential care, and increasing numbers of people are moving to supported housing or back to their families with some form of added support. 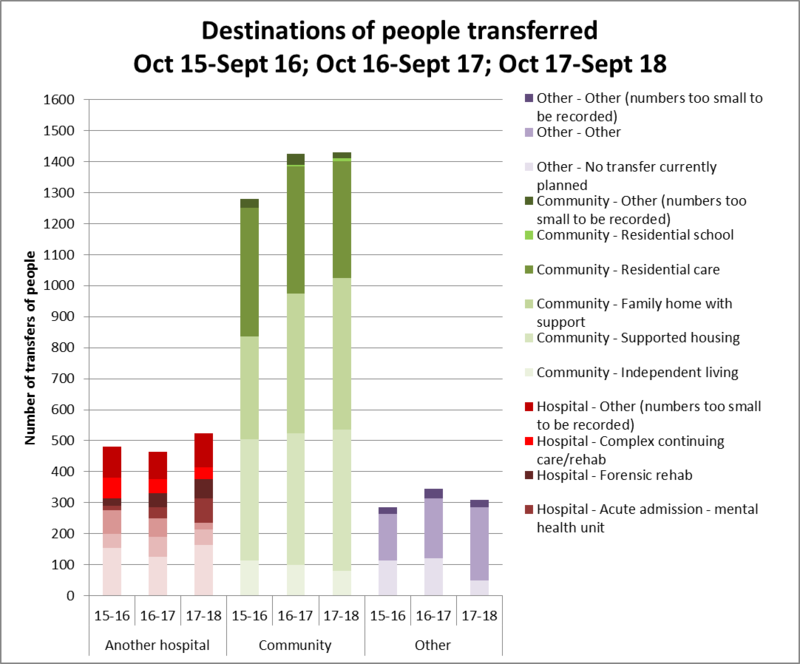 So in this final post in the series, there are definite signs that Transforming Care is exerting pressure for more people to have plans to leave their current inpatient services, and almost half of those people who are leaving are moving to independent or supported living or back to the family home. There are real worries about the feasibility and sustainability of some of these plans, and the extent to which many people ‘leaving’ inpatient services are actually leaving for something radically different or being churned around a system that doesn’t call itself an inpatient service system but looks mighty similar to the people living within it. The fact that for almost a quarter of people being 'discharged', they are actually being moved to another inpatient unit, is to my mind something of an indictment of the inpatient service 'system' and Transforming Care's lack of fundamental impact upon it. This blogpost is the third of four looking at the Transforming Care programme through the prism of the national statistics regularly produced by the ever excellent @NHSDigital, and updating a series of blogposts I wrote towards the end of 2017 on the same issues. This blogpost will focus on what the statistics are telling us about planning within inpatient services, just using statistics from Assuring Transformation. As Transforming Care moves towards a close (or not), its effects should be felt through the inpatient care plans people have, whether people’s needs are being regularly reviewed, and whether people are having regular, effective Care and Treatment Reviews (CTRs). 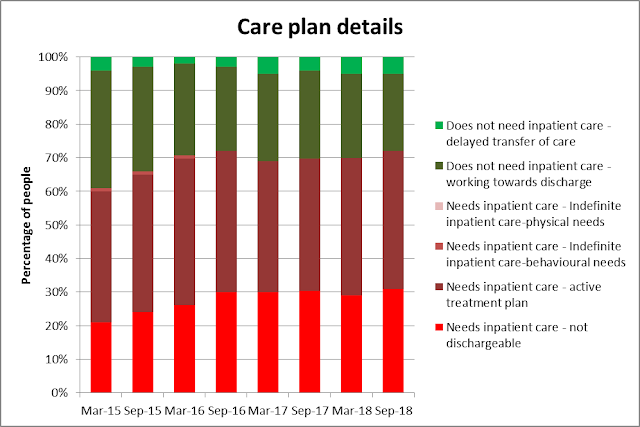 The first graph below shows the details of care plans for people according to inpatient services, from March 2015 through to September 2018. By September 2018, almost a third of people (31%) were labelled ‘not dischargeable’, up 10% from 21% in March 2015. The proportion of people with an active treatment plan but no plan to leave has stayed pretty static over time (41% of people in September 2018). The proportion of people actively working towards a plan to leave with a plan in place has dropped over time, from over a third (35%) in March 2015 to under a quarter (23%) in September 2018. Delayed transfers of care have gradually crept up over time, and are now standing at 5% of people in September 2018. From these figures, it is impossible to tell whether these changes are due to changes in what inpatient services are doing, or changes in who is in inpatient services. For example, if Transforming Care is being effective in supporting ‘dischargeable’ people (nice phrase) to leave inpatient services, then the proportion of ‘undischargeable’ people (even nicer phrase) left in inpatient services will go up. But it does mean that, towards the end of Transforming Care, there are well over a quarter of people (28% in September 2018) in inpatient services when, according to their care plans, they don’t need to be there. For everyone in inpatient services, reviews should happen regularly. The graph below shows how long ago people in inpatient services had had their last review, from March 2015 to September 2018. The graph generally shows that things seemed to get worse in 2016 but improved again in 2017 and was maintained through 2018. By September 2018, well over a quarter of people (29%) had had a review in the past 12 weeks, and almost a quarter (23%) between 12 weeks and 6 months ago. However, almost a further quarter (22%) last had a review between 6 months and a year ago, and another 23% had last had a review over a year ago. A particular form of review introduced by Transforming Care as a way to bring in independent voices to challenge inpatient services is the Care and Treatment Review (CTR). 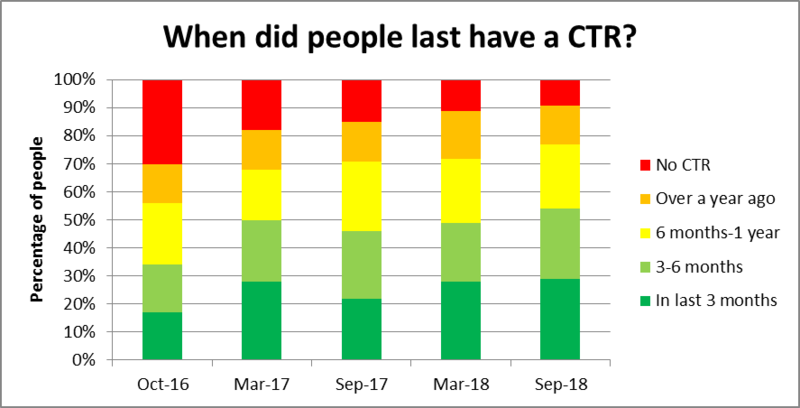 The graph below reports the last time people in inpatient services had had a CTR, from October 2016 to September 2018. The graph shows that the vast majority of people in inpatient services have had a CTR at some point (91% of people in September 2018), and that this coverage has increased from 70% of people in October 2016. Perhaps one concern is that 14% of people last had a CTR more than a year ago, a proportion that has stayed fairly consistent over time. The graph below shows when people are next scheduled to have a CTR. Again, there are improvements from October 2016 to September 2018, where the proportion of people with no scheduled future CTR dropped from over half (55%) to around one in six people (17%). 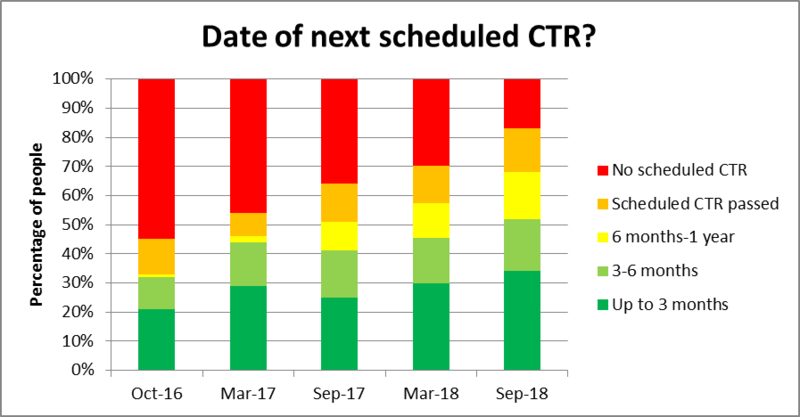 For a further 15% of people in September 2018 the date for their scheduled CTR had passed without a CTR happening, a proportion that is gradually creeping up. Overall there are signs that more people in inpatient services are having both regular reviews and Care and Treatment Reviews. 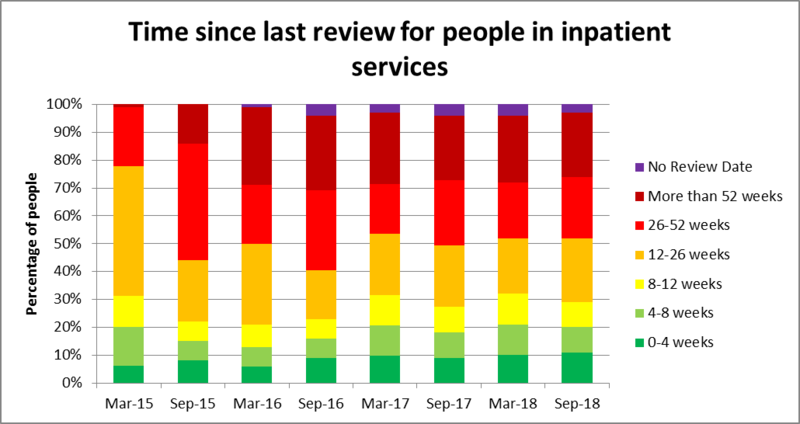 There are still large numbers of people in inpatient services who have not had any sort of review for a long time, however, and there are still well over a quarter of people in inpatient units whose care plan says they don’t need to be there. Transforming Care report card 2: How far are people from home, for how long? 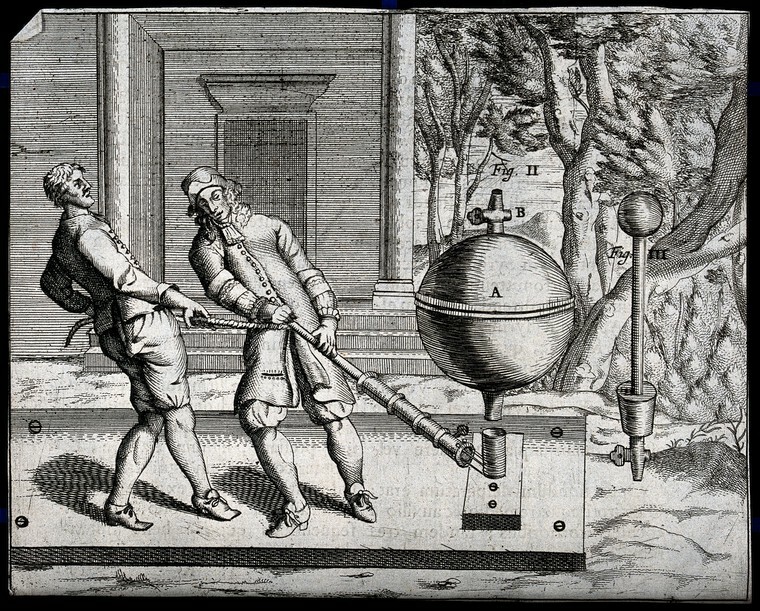 This blogpost is the second of four, updating a series of blogposts on various aspects of Transforming Care I wrote towards the end of 2017. The first blogpost in this updated series looked at who was being admitted to inpatient units, and where they were being admitted from. This second blogpost will focus on two aspects of what happens to people in inpatient services, how far people are from home and how long they are in inpatient services. They use two sources of information, both provided by NHS Digital; the Assuring Transformation dataset and the Mental Health Services Dataset (MHSDS). Rather than going through the differences between them again (and the differences are important) there’s a short description in the previous post which is worth having a look at. One of the main things highlighted by Transforming Care is having crisis and inpatient services close to home. 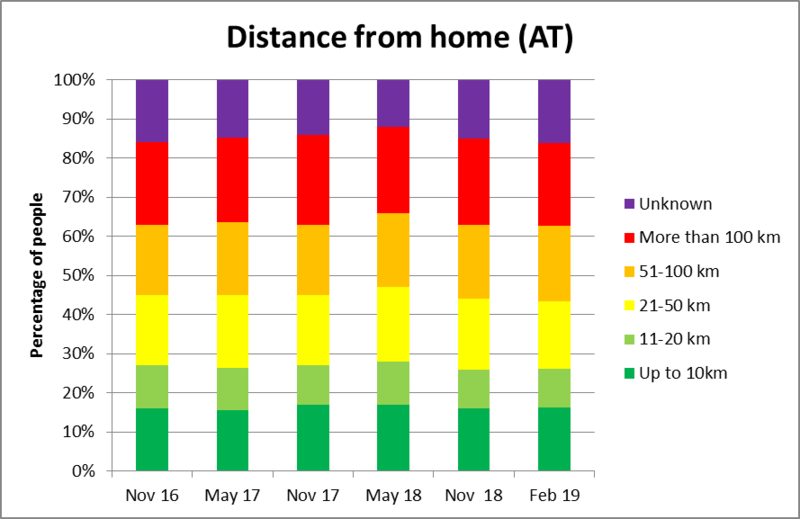 The graph below reports information on the ‘distance from home’ of people in inpatient units, as reported in the Assuring Transformation dataset. The graph firstly shows that there has been virtually no change in how far people are from home, from November 2016 to February 2019. 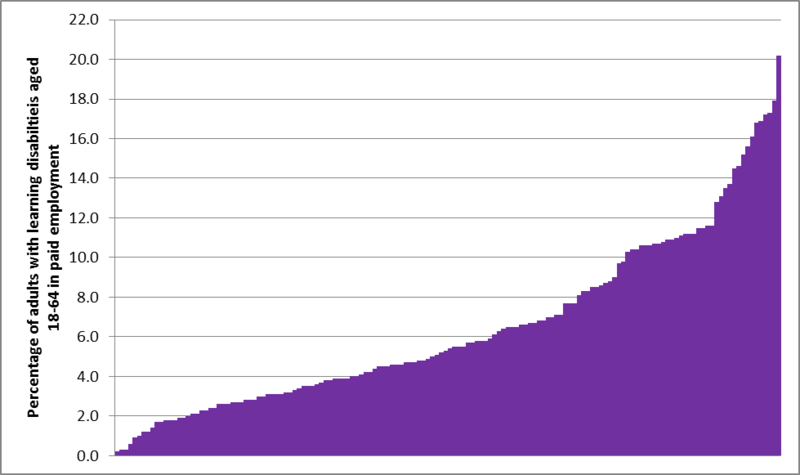 Secondly, the graph shows that a lot of people are a very long way from home. In February 2019, substantially fewer than half of people (1,015 people; 43%) were less than 50km from home (hardly a short distance). Almost one in five people (430 people; 19%) were in inpatient units between 50km and 100km from home, and a further one in five people (485 people; 21%) were in inpatient units more than 100km from home. Thirdly, for one in six people (360 people; 16%) commissioners cannot even report how far they are from home, a proportion that has stayed consistent for well over two years. 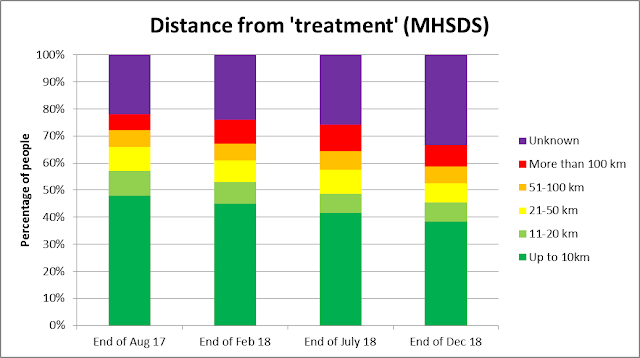 The graph below shows equivalent information from the MHSDS, which with its inclusion of people in short-term mainstream mental health inpatient units (including for ‘respite care’ – see the last blogpost), presents a very different picture. However, the trends over time are concerning. Most obviously, the recording of this information is getting worse rather than better over time – for a third of people (33%) in December 2018 the distance from ‘treatment’ (interesting difference in wording compared to Assuring Transformation) was unknown, compared to 22% of people in August 2017. This makes any other trends over time (which mainly show a reduction in the number of people living less than 10km away from ‘treatment’ over time) difficult to interpret, as it could be that local people in inpatient units for short periods of time (e.g. for respite) are less likely to have their home postcodes recorded in the MHSDS. Another important aim of Transforming Care is to reduce the length of time that people spend in inpatient units. 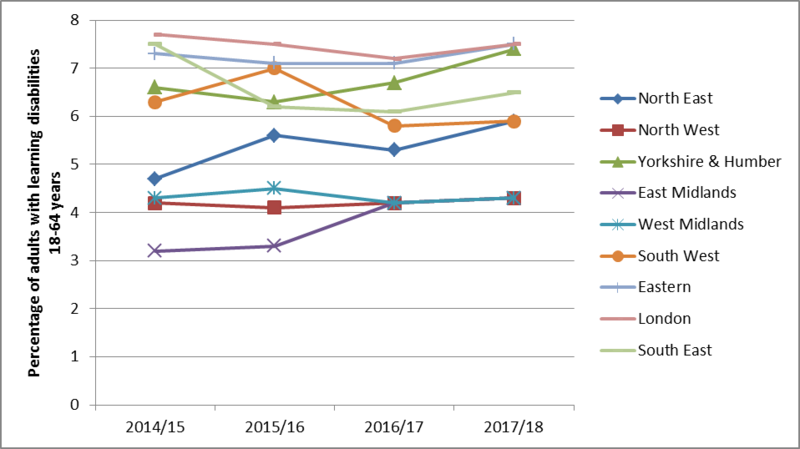 The graph below shows how long people have been in their current inpatient unit according to Assuring Transformation statistics, from March 2015 through to September 2018. There are very gradual but steady trends over time towards a greater proportion of people being in their current inpatient unit for shorter lengths of time, although in September 2018 14% of people had been in their current inpatient unit for 5 years or longer (so far). As I mentioned in the previous post, these is a lot of evidence that substantial numbers of people are moved around different inpatient services without ever leaving the inpatient service system. Assuring Transformation also reports information on how long people have been continuously within inpatient services (not just how long they have been in their current unit). The graph below shows this information from March 2015 to September 2018. 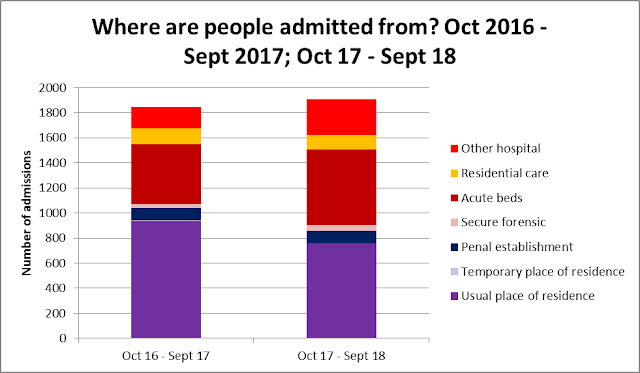 The extent of people being transferred around can be clearly seen; in September 2018 well over a third of people (37%) had been continuously in inpatient services for 5 years or longer, a proportion that has hardly changed from March 2015. Finally, Assuring Transformation also reports the average length of time that people have been in their current inpatient unit, and continuously in inpatient services. 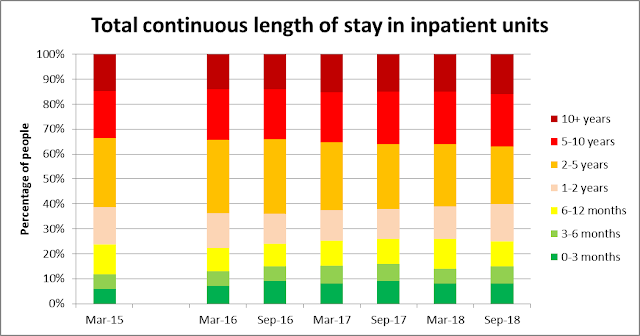 The graph below shows that people were on average in their current inpatient unit for under 3 years, with this length of stay gradually falling from March 2015. In contrast, the total length of time people have been continuously in inpatient services has increased slightly and is now standing at an average 5 years 6 months. What does this mean? First, it’s obvious that inpatient services have not become more local as Transforming Care has ‘progressed’, with Assuring Transformation reporting that two fifths of people are more than 50km from home and this information simply not being reported for many people. The information on how long people are staying in inpatient units reflects the increasing ‘churn’ of people between inpatient units without seeing the outside world, with people still on average spending 5 and a half years continuously in some form of inpatient unit. Reducing distance from home and length of stay were both supposed to be central to Transforming Care – as far as we can tell, these have not improved and may in some respects be getting worse. 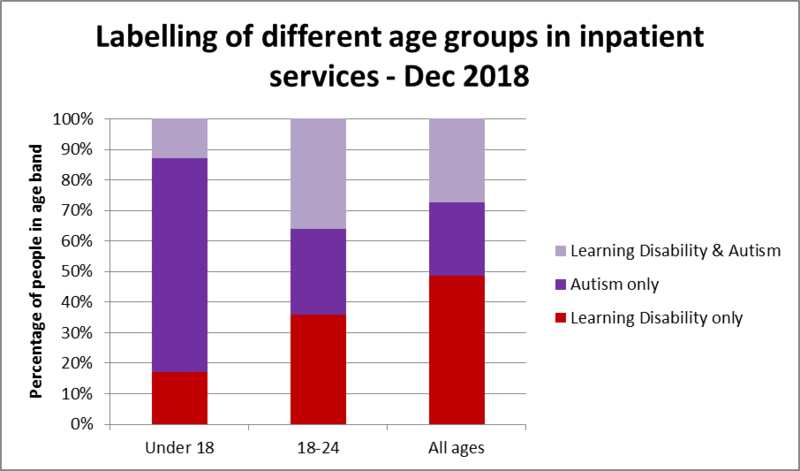 Towards the end of 2017 I did a five-day series of blogposts (you lucky people…) on the progress of Transforming Care in reducing the number of people with learning disabilities and autistic people in inpatient units (see here for the first of the five), according to the available statistics. As Transforming Care does or does not come to an end at the end of March 2019, I thought it might be useful to update four of these five blogposts. Leaving aside the issue of the overall number of people in these inpatient units (I’m confident this will be covered elsewhere), I want to look again at some of the other statistics that give us some clues about what has been happening with Transforming Care and what we might expect to find in the near future. These blogposts will focus on information produced publicly by NHS Digital from two datasets. First, the Assuring Transformation dataset – for this dataset, health service commissioners provide information (sometimes retrospectively) on the number of people with learning disabilities and autistic people in specialist inpatient services and on various aspects of what is happening with or to people. I’ve collected some of the information into six-month or yearly blocks, and some of the information I report for every three or six months rather than every month (both you and I would not survive that amount of information…). This means that most of the information goes up to September 2018 or at the latest December 2018. Second, the Mental Health Services Dataset (MHSDS – also available via this web address), which reports information collected by mental health service providers concerning people identified by them as a person with learning disabilities or an autistic person – this has been published monthly starting more recently than the Assuring Transformation dataset and is less detailed about processes. 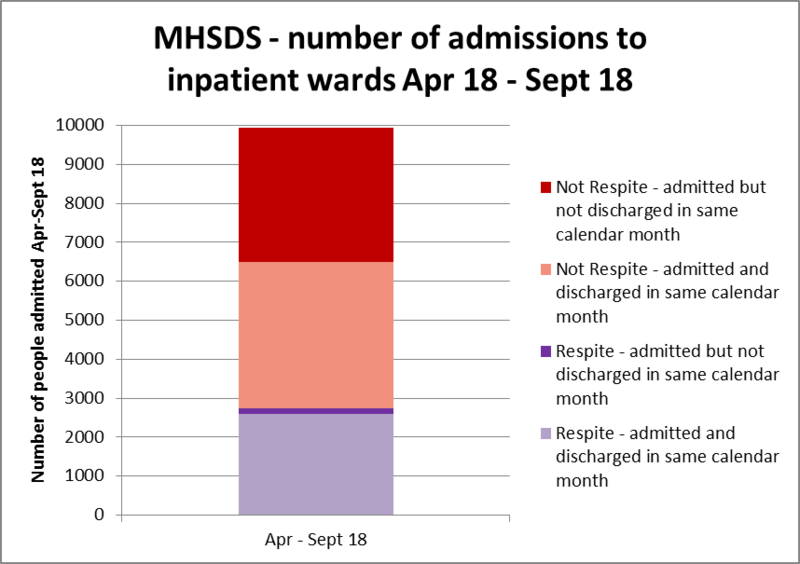 In different ways both datasets are partial – Assuring Transformation does not include a lot of people in mainstream mental health inpatient units, and some big independent sector inpatient service organisations are not yet reporting to the MHSDS. Who is going into inpatient services? How long are people spending in inpatient services? What planning and review is happening in inpatient services? What is happening about people leaving inpatient services, and where are they going? 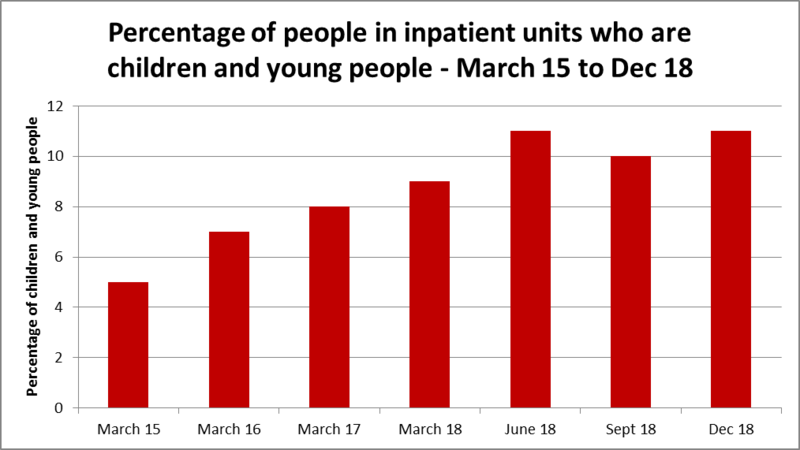 So – much of the focus of the Transforming Care programme has been on getting people out of inpatient units, but the slower than planned reduction in the overall number of people in these units suggests that there are still substantial numbers of people coming into these units. What do the statistics tell us about this? Every month, the Assuring Transformation statistics report how many people have come into an inpatient unit (called ‘admissions’) according to commissioners. The graph below adds these together across three different years, October 2015 to September 2016, October 2016 to September 2017, and (you guessed it) October 2017 to September 2018), so we can see the number of people coming into these units and whether they have changed over time. The first thing the graph shows us is the overall number of admissions to inpatient services is still increasing, from 1,810 admissions in 2015/16 to 1,980 admissions in 2017/18. The second thing to notice is that an increasing number of admissions (the red chunk) are actually transfers from other hospitals (mainly other inpatient services of various types), with a sharp increase in 2017/18 up to over a quarter (28%) of all admissions. This churn around the inpatient service system is something that will feature in later posts too, and it seems to be increasing rather than decreasing. 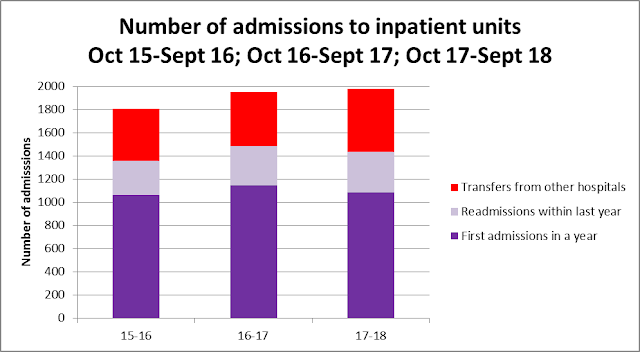 The third thing I want to mention is that more than one in six admissions (the lilac chunk, 18% in 2017/18) are readmissions, where people had previously been in an inpatient service less than a year before – the number of these people are increasing over time too. Finally, the purple chunk shows that just over half of admissions to inpatient services (55% in 2017/18) are people who have not been in an inpatient unit for at least a year (or maybe never). Information from the MHSDS tells a very different story. The graph below shows information on how many times people with learning disabilities and autistic people have been admitted to inpatient units/wards, for just six months (April to September 2018). The most obvious thing is the headline figure of 9,950 admissions in six months, a rate of people being admitted 10 times higher than that reported in the Assuring Transformation dataset. What does this vastly higher headline figure include? First, it includes a lot of admissions of inpatient units for the purposes of ‘respite care’ – there were 2,745 occasions (28% of admissions) when people were admitted for respite care in these six months, and for almost all of these episodes of respite care (94%) the person was in and out of the unit for a short period of time, within the same calendar month (other people may also have been in for short periods of time but just crossing the boundary of a calendar month). In the same six months there were 7,205 admissions to inpatient units ‘not for respite’ purposes. Just over half of these admissions (3,750 admissions, 52%) were for people who went in and out of the unit within the same calendar month. The MHSDS is clearly providing a completely different picture to the Assuring Transformation dataset, mainly because it is recording a huge number of people going into and out of (mainly general mental health) inpatient wards for short periods of time and for a range of reasons (are inpatient units the most appropriate place for ‘respite care’?). Transforming Care as a programme seems to be paying no attention to the experience of these large numbers of people with learning disabilities and autistic people. What kinds of places are people being admitted to inpatient services coming from? The graph below shows this information from the Assuring Transformation statistics, for two one-year blocks, October 2016 to September 2017 and October 2017 to September 2018. Even from one year to the next, the picture is changing. In 2017/18, 40% of people (760) were admitted from their ‘usual place of residence’, down sharply from half of people (51%; 935 people) in 2016/17. In 2017/18, getting on for half of all people admitted to inpatient units (49%; 935 people) were admitted from other inpatient and/or hospital services, particularly from ‘acute beds’ (which presumably includes people being transferred from mainstream mental health inpatient services) – sharply up from 2016/17 (37%; 680 people). A further 100 people (5%) in both 2016/17 and 2017/18 were admitted from ‘penal establishments’ and similar numbers of people (125 people; 7% in 2016/17; 115 people; 6%; in 2017/18) were admitted from residential care services. Overall, it seems like the pressures are continuing to build, for which inpatient services are being used as a response, with an increasing number of people being ferried straight from one inpatient service to another or being re-admitted after a short time out of an inpatient service. While it might be a marker of progress for Transforming Care that fewer people are coming into inpatient units from their ‘usual place of residence’, the increasing number of people being churned around the inpatient system and being re-admitted into inpatient services are clear markers that inpatient services are not doing their job and the support that people are getting on leaving inpatient units may not be enough. 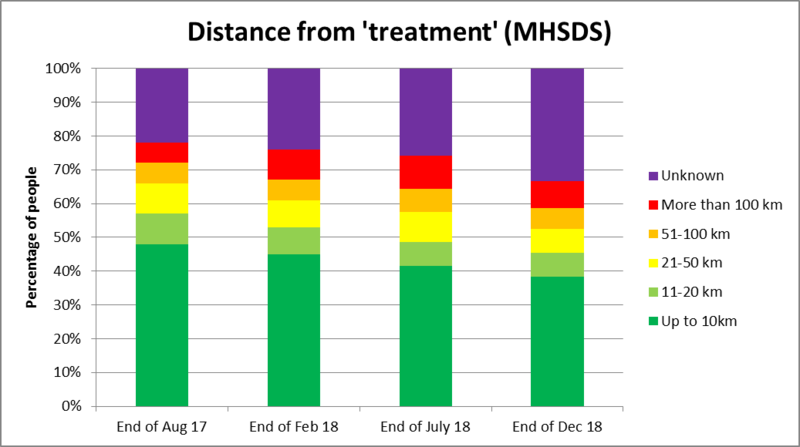 The MHSDS dataset also presents a worrying picture seemingly ignored in the Transforming Care programme, of large numbers of people going into mental health inpatient units, often for short periods of time. Does this help people, or is it another sign of a potentially increasing lack of decent community support? These are questions that Transforming Care, or any potential successor, needs to urgently deal with. Children and young people with learning disabilities and autistic children and young people in inpatient units - what do the statistics tell us? This blogpost tries to summarise what information is available concerning children and young people with learning disabilities and autistic children and young people (in this blog, when I talk about ‘children and young people’, these are the groups of children and young people I’m referring to) in inpatient units in England, according to publicly available statistics from NHS Digital. By children and young people, I mean the age band of under 18 years old used in the datasets. 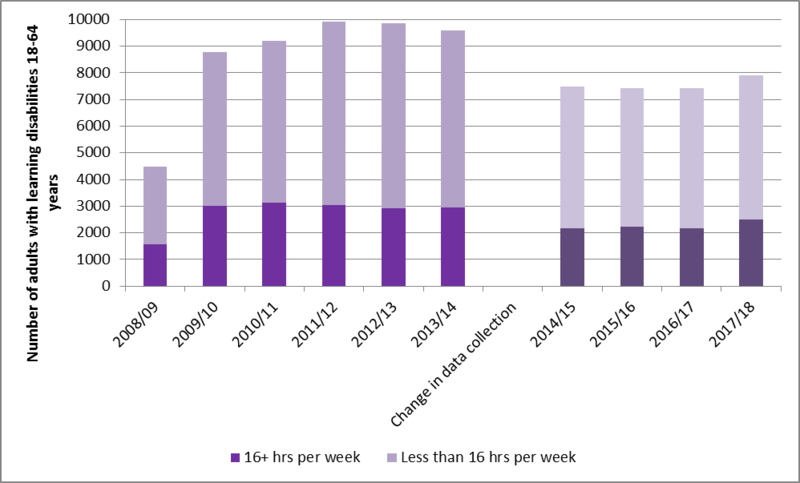 Most of the available information is from the Assuring Transformation dataset, which is recorded (sometimes retrospectively) by commissioners and reported monthly by NHS Digital. This dataset is the one that NHS England uses to assess how it is doing against the targets set in Transforming Care. Every month, the reference tables spreadsheet reports some information broken down by age band – although not everything is broken down by age band (it would take a quite monstrous excel file to do that) there are some things that have been reported consistently over time and some new information by age band that has been recently added. The first question is how many children and young people are in inpatient units, according to the commissioners reporting to the Assuring Transformation dataset? 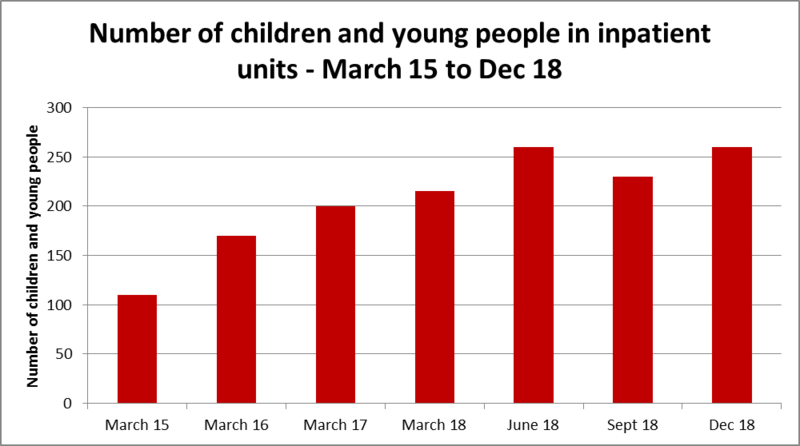 The first graph below shows that, in absolute terms, the number of children and young people in inpatient units has increased from 170 children/young people in March 2016 (more reliably collected data than in March 2015) to 260 children/young people in December 2018, an increase of 53% over that time. As the total number of people recorded by Assuring Transformation as being in inpatient units decreases, the percentage of the inpatient population who are children and young people is increasing rapidly. 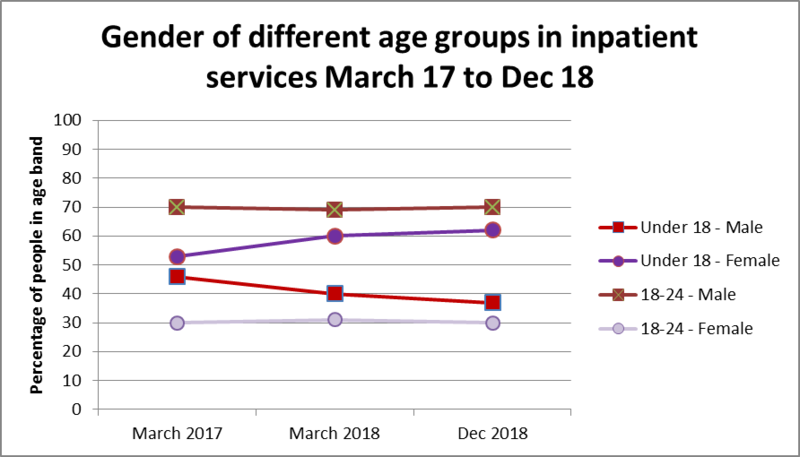 As of December 2018, 11% of all people with learning disabilities and autistic people in inpatient units are children and young people aged under 18, up from 7% in March 2016 (see the graph below). Assuring Transformation records snapshots of the number of children/young people with learning disabilities and autistic children/young people at single points in time. For a number of reasons the issue is even bigger than the 260 children and young people recorded by Assuring Transformation. 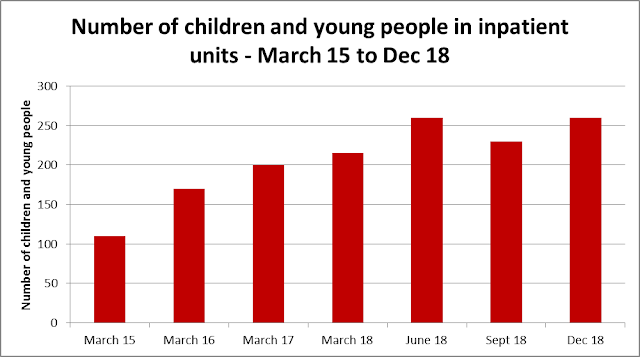 First, commissioners can report retrospectively to Assuring Transformation, so the number of children and young people recorded for December is likely to increase. Second, children and young people can go in and out of inpatient units, so the number of children and young people in an inpatient unit at some point over the course of a year will be bigger than a snapshot count of children at any one time (particularly as some young people reach the age of 18 and either remain in the inpatient unit or get transferred directly to a different inpatient unit). For example, the Mental Health Services Dataset (MHSDS), analysed monthly by NHS Digital from mental health service provider returns, reports that in the month of November 2018 alone 500 children and young people with learning disabilities and autistic children and young people spent some time (often a very short time) in some form of mental health inpatient unit. Third, children and young people can be in a range of residential services that feel and operate like inpatient units but are not registered or counted as such, such as certain types of residential special schools or ‘specialist’ residential homes. The second question is what do we know about the children and young people in these inpatient units? Although information is limited, there is enough to show that they are quite different to people in other age bands, even 18-24 year olds. 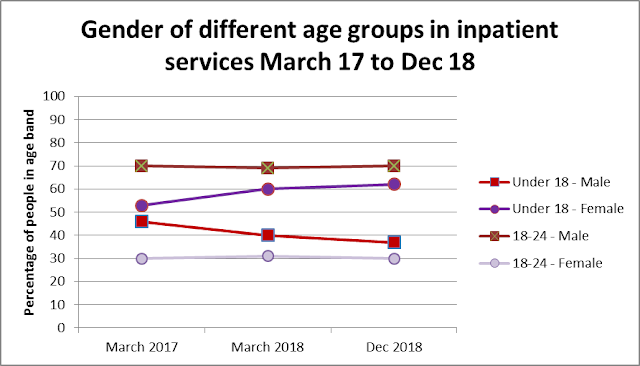 As the graphs below show, most children and young people in inpatient units are female (and increasingly so over time – 62% of children and young people in December 2018) whereas most 18-24 year olds (70%) are male. Most children and young people in inpatient units are labelled as ‘autism only’ (70% of children and young people in December 2018), whereas for 18-24 year olds the labels are more evenly distributed. The legal status of children and young people is also different to people in other age bands, as the graph below shows. Over two fifths of children and young people have informal legal status (110 people; 42%) and almost everyone else (140 people; 54%) is on a Part II section. For 18-24 year olds, only 6% of people have informal legal status, with 68% on a Part II section and a further 24% on a Part III section. There is a similar picture in terms of the level of security of the wards that children and young people are subject to, as the graph below shows. Most children and young people (175 people; 69%) are in wards with a general level of security, with most of the rest (50 people; 19%) in low secure wards. 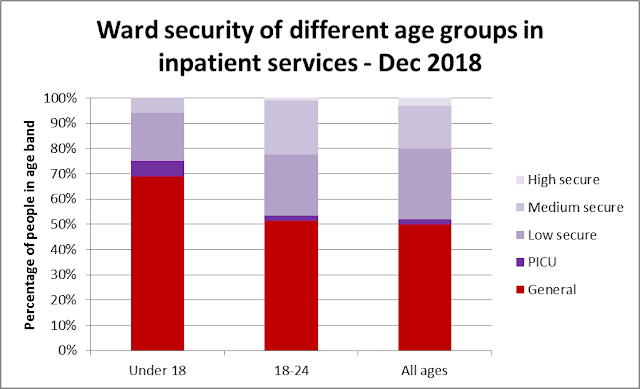 For 18-24 year olds, just over half of people are in wards with a general level of security (51%), with substantial numbers of people in low secure (24%) and medium secure (21%) wards. What are the prospects for children and young people getting out of the inpatient unit they are in? Assuring Transformation records if a person has a planned transfer date of which the ‘home’ authority is aware – only 15% of children and young people (40 people) had such a planned transfer date, compared to 28% of 18-24 year olds and 30% of people of all ages in inpatient units. Similarly to people generally in inpatient units (61%), 63% of children and young people were reported to have their family involved in their care plan. Finally, in a different dataset (the MHSDS) mental health service providers report the ‘restrictive interventions’ that people with learning disabilities and autistic people in inpatient units are subject to (a previous blogpost describes the dataset in more depth). 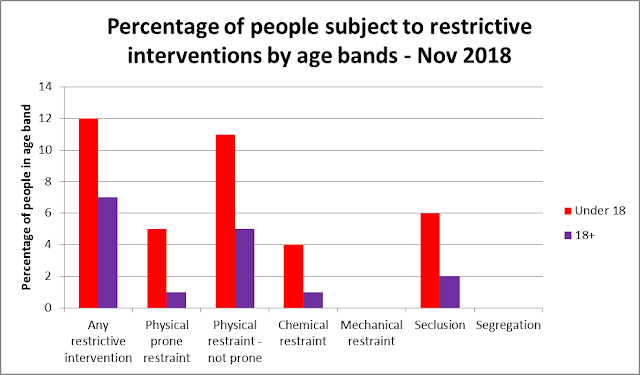 The graph below shows the percentage of children/young people and the percentage of adults who experienced any restrictive intervention, and specific types of restrictive intervention, at some point in the month of November 2018. As the graph shows, 12% of children and young people compared to 7% of adults experienced some form of restrictive intervention in November 2018. Children and young people were also more likely to experience almost every specific type of restrictive intervention than adults: physical prone restraint (5% vs 1%); physical restraint (not prone) (11% vs 5%); chemical restraint (4% vs 1%); and seclusion (6% vs 2%). 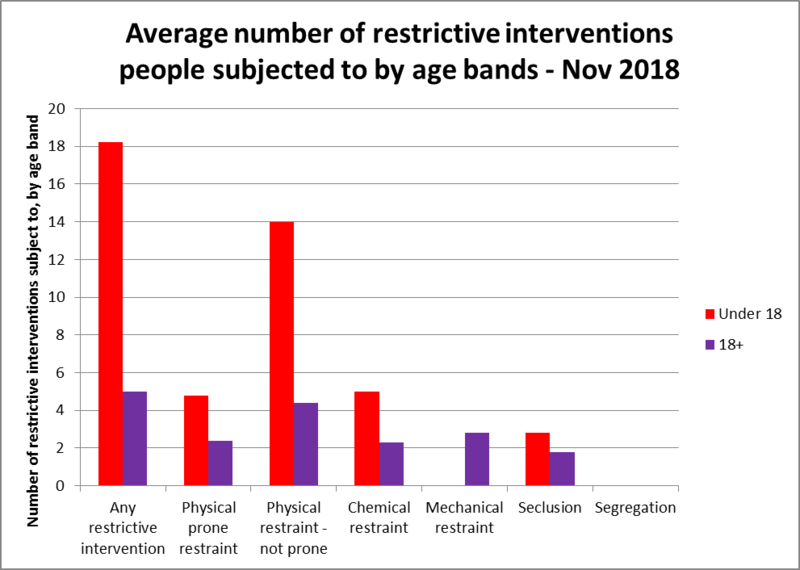 As well as reporting the number of people experiencing restrictive interventions, the MHSDS also reports the number of restrictive interventions people have experienced. From this we can calculate the average number of times during the month of November 2018 that people experienced a restrictive intervention. The graph below shows this for children and young people and adults. As the graph shows, children and young people in inpatient units experienced restrictive interventions much more frequently than adults. For the 60 children and young people who experienced a restrictive intervention in November 2018, they experienced an average number of 18.2 restrictive interventions compared to 5.0 for adults. With the exception of mechanical restraint, children and young people, compared to adults, experienced more frequent restrictive interventions of all types: physical prone restraint (4.8 times per child/young person in November compared to 2.4 times per adult); physical restraint (not prone) (14.0 vs 4.4 times in the month); chemical restraint (5.0 vs 2.3 times in the month); mechanical restraint (0 vs 2.8 times in the month); and seclusion (2.8 vs 1.8 times in the month). So not only are children and young people more likely to be subject to restraint, if they are subject to restraint they are subject to that restraint more frequently than adults. Overall, although public information is limited, the picture is looking bleak for children and young people with learning disabilities and autistic children and young people when it comes to inpatient services. It seems obvious that the group of children and young people in inpatient services are in some respects different from adults, being mostly girls and young women and mostly autistic children and young people. 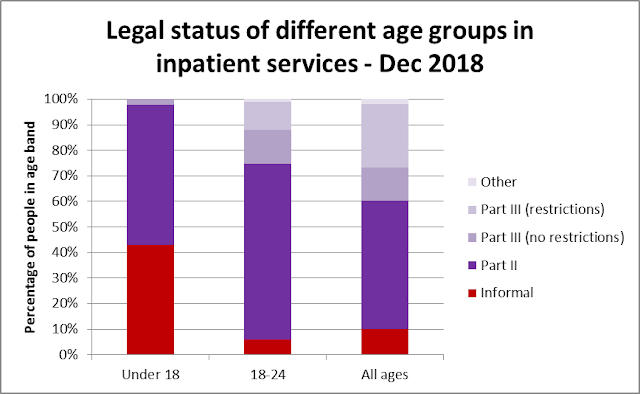 Children and young people are more likely to be in inpatient units with an informal legal status, and to be in general or low secure inpatient wards, but are much less likely to have a planned transfer date out of the unit they are in. Within inpatient units, children and young people are almost twice as likely to experience restraint compared to adults in inpatient units, at more than three times the frequency (on average, more than four times every week for those experiencing restrictive interventions). With child and family poverty increasing, education and support for disabled children at the lowest of ebbs, and legislation routinely ignored by authorities there to ‘help’, this is an issue way beyond Transforming Care. This blogpost is a bit unusual, and I'm nervous about it. It's the first draft of something I wrote for the Guardian's Academics Anonymous section last year. They decided in the end it was too gnomic for them to publish (they wanted specific experiences, which I was reluctant to provide). I came across it the other day while looking for something else and, after reading it, I thought I shouldn't be hiding behind anonymity, so here it is. I think the only thing I'd add at this point is a practical suggestion that all publicly funded bodies should have to keep a public, accessible register of what projects they have commissioned, what the expected products are, and when they should be made public (with links to where the products can be found). If something changes from the original plan, the public body should add to the register reasons why things didn't work out as planned and what's going to happen next. It should be relatively straightforward to do and to update, and provide the same level of transparency that is already required of councils. Just how many are there? Commissions, projects agreed in a couple of vague emails at the end of the financial year, pieces of ‘consultancy’, ‘a little bit of an evaluation’? How much public money is being spent, often via those quangoids that seem to endlessly proliferate no matter how bad times get? [I have to say I have had occasionally similar experiences with big charities, where it’s the money of all those fund-raising marathon runners that is being spent]. And how many of these projects never see the light of day, doomed to exist as shades in an underworld where they will never be known? I have a bit of a guilty secret. As an academic working in an area broadly defined as health, I’ve done this kind of work. Some of them appear on my CV, especially if something has come out of them. But some of them don’t. How many other academics are in a similar position to me? It’s hard to know. It’s not the kind of thing that we talk about much, unless it’s late at night at a conference bar with people you trust. It’s shame. Why shame? Well, depending on our academic position it can be time wasted for us, and academic integrity sometimes bartered away. But the hole of a project with nothing to show for it is much more important for the CV of the short-term researcher who worked on the project, often precariously jumping from project to project with no chance to build a CV or a consistent set of interests. And we may well have made promises – to people bravely speaking out about their experiences of a particular service, or professionals telling uncomfortable truths – “Your voice will be heard, not like the other times when you were ‘consulted’, this time it will be different”. How can you look these people in the eye, knowing that their contributions have been ignored or betrayed, again? Why do I and others do this kind of stuff, when the potential for your work to be squished is plain and you might be putting your professional integrity on the line? In my case (and that of some others I’ve spoken to) it’s not pressure from the university – these projects are usually short-term and small beer financially, the overheads aren’t up to much, their potential for ‘impact’ or ‘engagement’ is marginal, there are no REFty publications to be had, and they can’t be counted as research income. [As an aside, I find it quite revealing that one criterion my university uses for deciding if income is consultancy or research is the potential for suppression on the part of the funder]. I don’t think it’s a misplaced quest for glory (this is rarely the high road to the high chair), although it might be a misplaced sense of getting close to where the action is, the fabled ‘influence’. I think most of the time it’s a desire to be useful. When ResearchGate thinks you need a special email to tell you that ‘someone has read your work’, a gnawing sense of the futility of standard academic work is never far away, and this might just be your chance to make a difference. And you can get sucked into the delusion of necessity – if you don’t do it, who will, or won’t it happen at all? And even though many quangoids and government departments present as walls of suits, they are never (well, rarely) monoliths of evil – even a Death Star may have its Finn, struggling to get out of his corporate Imperial Stormtrooper garb. Usually there are some brilliant people working in these places, taking the insider hit to try and achieve something meaningful within environments that may be supporting them or more commonly resisting them. Their work is often grinding and thankless, and I find myself wanting to do my bit to help and support them. But even if you come to an agreement with one of these undercover Jedi, there’s no guarantee that your work won’t be buried. The person you’re working with may well move on (or be moved on). If you’re lucky people further up the hierarchy won’t be paying attention. People who reach, and enjoy, the upper reaches of quangoids or government departments often have a completely different sense of what is important. Reality and integrity can be pretty low in their list of priorities – what matters is preserving the amour propre of a minister (although the minister concerned is unlikely to know this is being done in their name), and not putting any reality dent into the gleaming, illusory policy vehicle these people think they’ve constructed. Senior enthusiasm (premature grandiose claims, press releases you have no control over, the urge to turn something local and useful into a national programme with a snappy acronym of its own, the descent of swarms of peripatetic project management types) can be just as harmful as senior hostility. And there are all sorts of ways that hostile, or resistant, people in these organisations can sabotage one of these projects. The cultural form that this pressure takes may have changed over the years (from Yes Minister through The Thick Of It to W1A), but not the fact of the pressure itself. For example, you can set up a double bind of setting very tight deadlines for a project, coupled with incessant reporting and micro-management such that no approvals and decisions are made in time for the project to be done. There are also myriad equivalents to the development hell that film makers describe – the contract is signed, but as the project progresses they just need some tweaks here, an adjustment there, and the money has run out before anything is done. Both of these are useful tactics for nudging a project away from what it was supposed to do into more comfortable channels of showing how marvellous the organisation is. Other common tactics are to sign a contract, but then demand either that you do it for half the money you said or that you do twice as much as agreed for the same amount of money. And this is before you get to more straightforward attempts to suppress your work. At the most extreme, the organisation can and does exert the right it has placed in the contract for the work not to be published. Or talked about. Or even to acknowledge that the work exists (do academics read the small print of contracts? We’re like a garage band of 17 year-olds signing our first record deal). Or a report can be dribbled out obscurely and quietly, while the organisation insists that you say absolutely nothing about it. This usually happens when the academic has offered some resistance to their work being invisibly rewritten by the organisation. This rewriting happens all the time, although in any product that emerges it’s only the academic’s name that is listed – “that’s written a bit negatively”, “I think it’s important to recognise the progress we’ve made”, “I wouldn’t say this service was poor, more that it has the opportunity to make a more exciting journey to outstandingitude”. Is that when the line of academic integrity is definitively crossed, or is it when you start to unthinkingly apply self-censorship and you write in this stuff within the organisation having to make you do it? The frustrating irony is that almost all this stuff is pretty boring and uncontroversial according to how most people would understand the term. 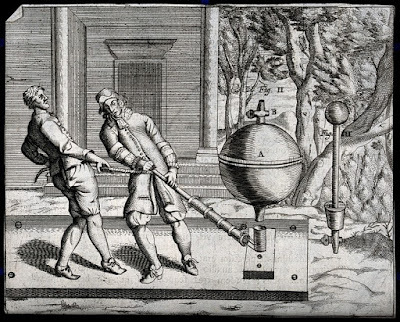 It’s surely good to have this stuff in the public domain, because that will help debates that lead to better decisions being made. It’s hardly Watergate, and trying to suppress something gives it a significance that it might not have otherwise. These organisations are funded by us, and supposedly exist for the public good. Why can’t we see what is being spent in our name, and how much is being wasted? Paid employment and people with learning disabilities in England: what do the statistics tell us? This blogpost updates previous posts on what the statistics say about the self/paid employment of working age (aged 18-64 years old) adults with learning disabilities in England. These figures are provided by local authorities every year, and since 2014/15 have only been provided for people getting long-term social care (before 2014/15 it was the larger group of people known to local authorities as a person with learning disabilities, even if they weren't getting long-term social care support). This means that these figures don't include the much, much larger group of adults with learning disabilities who aren't known to local authorities or GPs and who don't get any kind of support related to their learning disability. Some of the numbers reported here are included in the NHS Digital Adult Social Care Outcomes Framework (indicator 1E, if you're interested), although some of the numbers are more buried in publicly available but less accessible datafiles. The first graph below shows the number of working age adults with learning disabilities that councils say are in any self/paid employment, broken down by whether people are in employment for 16+ hours per week or less than 16 hours per week (and 1 hour a week can count in these statistics). 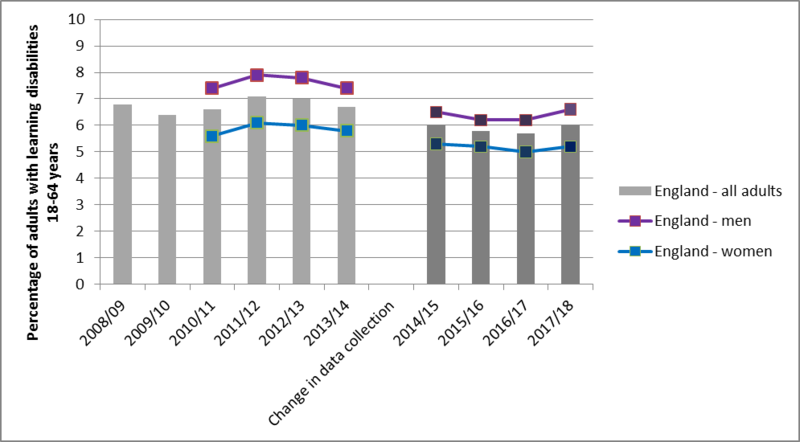 The gap between 2013/14 and 2014/15 is because of the change in data collection I mentioned earlier, so numbers before and after then can't be compared, and 2008/2009 was the first year that information was collected so it's rather dodgy for that year. According to these figures, in 2017/18 there were 7,907 working age adults with learning disabilities getting long-term social care in any form of self/paid employment. Overall, this looks like it might be a slight increase from around 7,400-7,500 people in the previous three years. Consistent across the years is that most of the people in employment (68% of people in 2017/18) are working for less than 16 hours per week. What do these numbers mean in terms of employment rates? The graph below shows the employment rates for working age adults with learning disabilities over the same time period. The columns show the overall employment rate - in 2017/18 this was 6.0%, compared to around 75% for adults generally. From 2014/15 to 2017/18 the overall employment rate for working age adults with learning disabilities has stayed pretty static at or just under 6%. The lines on the graph show employment rates for men and women with learning disabilities separately. Employment rates for men (the purple line) are consistently higher (6.6% in 2017/18) than employment rates for women (the blue line) (5.2% in 2017/18), with some tentative signs that this gender employment gap is increasing. Employment rates are also very different across regions, as you can see in the next graph below which shows employment rates for different regions from 2014/15 to 2017/18. The highest employment rates for working age adults with learning disabilities reported by councils were in the London (7.5%), Eastern (7.5%) and Yorkshire & Humber (7.4%) regions. The lowest employment rates were in the North West, East Midlands and West Midlands (all 4.3%). At an individual council level these differences in employment rates are even bigger, ranging from virtually 0% to over 20%, as the graph below shows. The last graph below sounds an appropriate note of caution about the reliability of information on self-paid employment provided by councils. This shows, for all working age adult with learning disabilities getting long-term social care, whether councils say they are: 1) in self-paid employment; 2) not in employment but actively seeking work (and presumably therefore liable to potential benefit sanctions); 3) not in employment but not actively seeking work. There is also a fourth category, where councils say they don't know the employment status of the person. 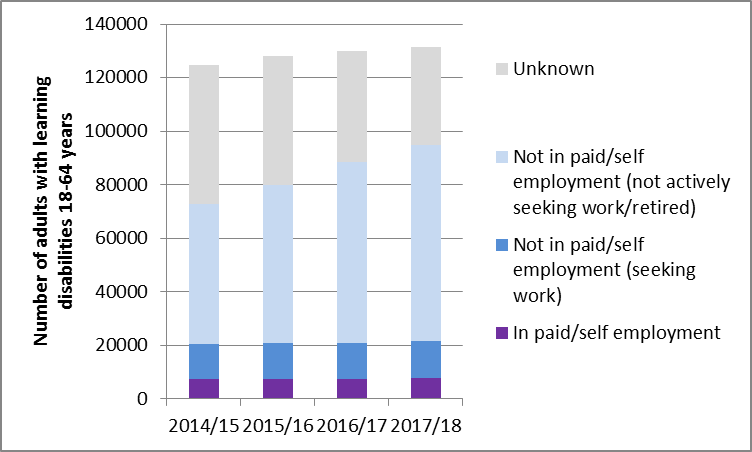 Over time, the number of people whose employment status is unknown has decreased rapidly, from 44% of working age adults with learning disabilities in 2014/15 to 28% of people in 2017/18 (28% is still a big chunk, however). This might also account for some of the apparent increase in the number of people employed in 2017/18, which might partly be because councils simply know about more people. It is unclear how councils are making decisions about whether to record someone as actively seeking work or not. Overall, this update shows little apparent change in the self/paid employment of working age adults with learning disabilities getting long-term social care, with most work being extremely part-time, a gender employment gap and big differences in employment rates across areas.